Beginner or expert, there are a few things you need to know so as to make your ski holiday a happy and safe experience. 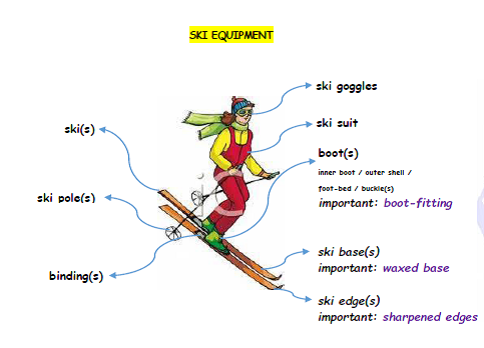 Prepare your ski holiday by being fit and well-equipped AND also by being confident in using English!This page will help you memorise some key terms related to skiing, ranging from waxed and edged skies to snow plough braking to skiing off-piste, based on tips provided by ulitmate-ski.com. 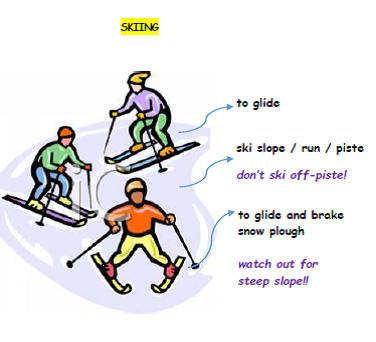 Download the picture dictionary SKIING HERE! ….make sure your skis are serviced. Do a safety check before you set off! You may also find some further tips for how to get ready for skiing HERE.